University of Victoria overhead campus view / watercolour painted by A.W. Edwards. – ca. 1964. Acc. No. 2004-003. The public campaign to raise funds to establish UVic engaged Victorians from all backgrounds and walks of life. Fittingly, the central library at UVic bears the names of two of the strongest early sparks that set fire to that movement. Victoria entrepreneur Thomas Shanks McPherson believed that the “single most important factor in the progress of a city” was the growth of a university. And though McPherson passed away a year before construction of the library began, his bequest funded the development of UVic’s present library. One of McPherson’s colleagues in advocating for a university, the business leader William C. Mearns was well known in the 1960s for his efforts to acquire the lands that make up the Gordon Head campus. With his substantial help, an unprecedented $5-million fundraising campaign was waged to establish the campus — making UVic the only university in Canada to have purchased its own land. Spurred by a new donation from the Mearns family, The William C. Mearns Centre for Learning opened in 2008, signaling a multigenerational commitment to philanthropy. The new media commons and enhanced archives and special collections in the Mearns Centre put the treasures of the past alongside technology that looks to the future, linking students and researchers with scholarship around the world. The expansion has renewed the library’s place at the heart of the campus, with a matched set of visionary benefactors named at the library entrance. 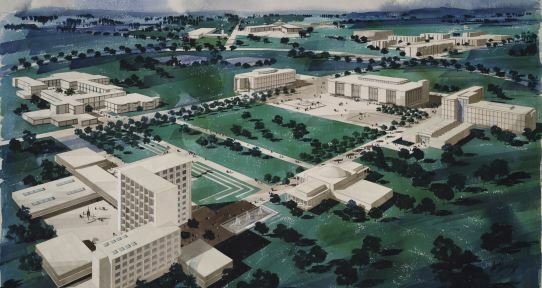 Planning for the McPherson Library building began in 1960. Initially intended for the Landsdowne Campus, the library site was changed with the decision to concentrate the new university in Gordon Head. Construction began in 1963 with the cornerstone being laid down by Lt. Governor G. R. Pearkes on July 2, 1963. A ceremony chaired by Chancellor Judge J.B. Clearihue commemorated the transition from Victoria College to the University of Victoria. Architects for the first stage of construction were R.W. Siddall Associates. Initially, the building housed the entire library collection with the exception of the Curriculum Library and the geography Map Library. However, by the time the library moved into its spacious new home in August 1964, it had expanded several times; the collection now included 150,000 volumes, and the staff had grown to 57, including 27 librarians. The library was named for Thomas Shanks McPherson (1873-1962). McPherson acquired major real estate in Victoria and upon his death on December 3, 1962, the bachelor philanthropist left a bequest of $2,250,000 to the university. The 1960s and early 1970s were years of explosive growth for both the university and the library. By 1971, the collection had reached 500,000 volumes, 155 staff positions, which included 36 professionals. It was apparent that the library building would soon be inadequate to meet the demands for housing the collection, staff, and services required by the growing institution. An expansion occurred between 1972 and 1974. Siddall Dennis Warner were the architects for this project. Noted British Columbian George A. Norris designed the white exterior pre-cast relief panels. Margaret Peterson designed the interior glass mosaic panel. With this expansion, the library was able to offer accommodation on its upper levels for various academic and administrative units such as the Faculty of Law. By 1982, the collection had reached 1,000,000 volumes and included nearly 1,500,000 items in microform. By 1985, economic pressures had reduced the rate of growth of the library’s collection, which then numbered 1,200,000 volumes. The staff numbered 140 of which 34 were professionals. With the exception of the Law Library, the Map Library, and Curriculum Library, all services were centralized in the McPherson Library. The library proceeded rapidly into the electronic age. Online databases exceeded 100 sources covering all disciplines and CD-ROMs provided further research potential. A virtual reference service providing real-time reference assistance over the Internet is one of the library’s new services. It enables students and faculty to get help with their information needs when they are not able to visit the library reference desk in person. A Learning Commons area has been developed whereby access to traditional material and new electronic formats are integrated. Computer workstations provide access to electronic resources, the library’s online catalogue, the internet, email, word processing, and other software applications. In addition, the library has a training classroom with 30 computer stations where librarians teach research skills to students and faculty. In 2002 , the library collection totalled 1,600,000 volumes and 1,900,000 items in microform. There are 12,000 current periodical subscriptions including 2,600 e-journals. The Music and Audio division currently holds 49,000 records, tapes, compact discs; 32,000 scores; and 6,500 films & videos. There are 144 on staff including 33 librarians. Over a period of 40 years, McPherson Library has constantly striven to meet the needs and aspirations of the students, faculty, and community at large.